Insulation putty for electrical insulation like gap filling in windings, armatures, stators and other electric apparatus for insulation. INTAF ® Putty H-200 is a Non-Asbestos, Moisture Resistant slate filled , solventless putty made of two part material (One part : Powder - 0.618 Kg & One part : Resin - 0.382 Kg) required to be mixed (see the photo below: Method to mix INTAF Putty H200) at the time of application and is converted to a tough infusible solid by heat. INTAF PUTTY H 200 is recommended for filling, potting, encapsulating and insulating all types of Electrical Apparatus and electronic components. It is particularly suitable for filling voids and spaces in Traction Motors and Generators. Because it is solventless, it eliminates many environmental and health problems for the user. 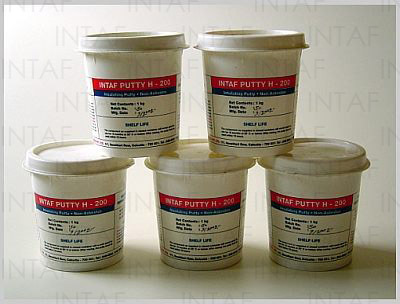 INTAF ® Putty H-200 can be applied by knife/spatula or by hand. Recommended for Gap filling in windings, armatures, stators and other electric apparatus for insulation, coating, heat transfer or environmental protection. All informations, recommendations and test data herein are offered only as a guide. We believe them to be accurate but do not guarantee results, freedom from patent infringement, suitability of this product for any resultant applcation.